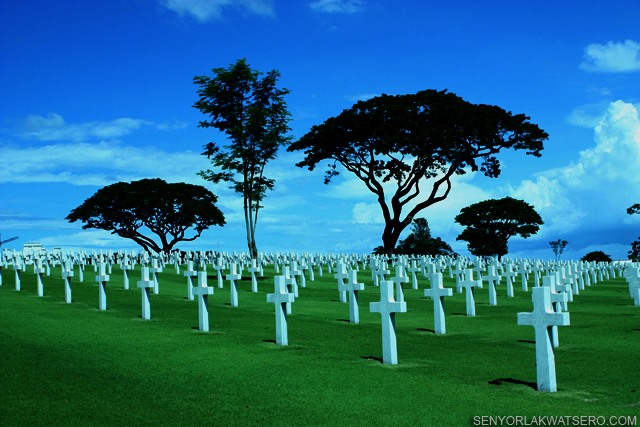 With a total of 17,206 white marble cross headstones aligned beautifully in circular patterns, and set in a 152 acres piece of land, the Manila American Cemetery and Memorial is said to be the largest cemetery in the Pacific dedicated in honor of the brave but unfortunate American men and women who lost their lives during World War II. 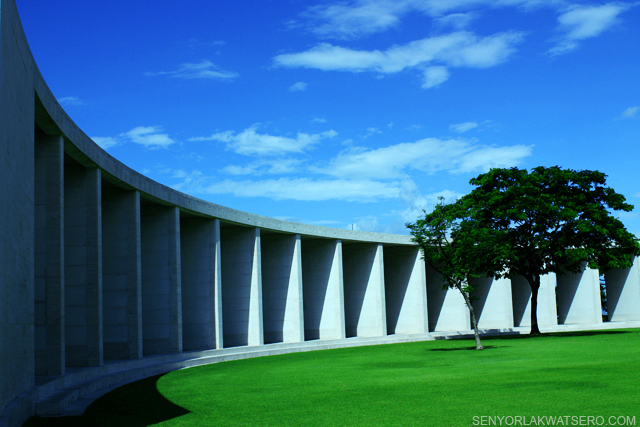 The cemetery is located at the Fort Bonifacio Global City, Taguig, Metro Manila, within the boundaries of the former Fort William McKinley. 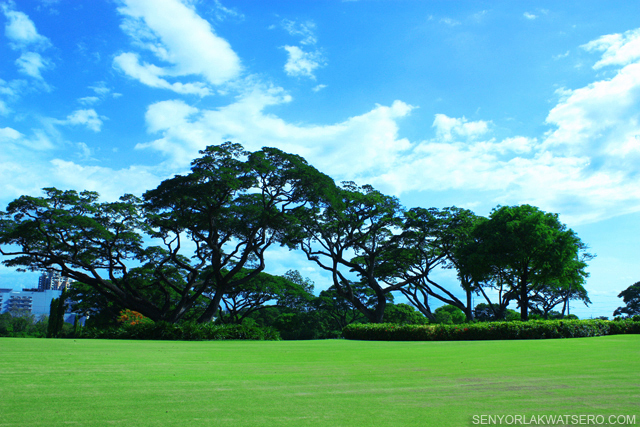 I came to know about the cemetery through photographer friends who used to go there for model photo shoots. Although I was instantly intrigued when I saw pictures of the cemetery for the first time, I didn’t exactly feel a strong urge to visit it immediately. I told myself, “Why would you want to go to a cemetery?” I don’t know anyone who were laid to rest there. Besides, I live in close proximity of the cemetery and I thought I would just go there when I have nothing else more interesting to do. And that’s what happened. Bored and home alone on a Sunday afternoon, I got out of bed, showered, put on a white shirt and a ripped up jeans, wore my sneakers, grabbed my camera and headed to the street to wait for a cab. After 10 minutes, I was already infront of the cemetery’s gate. I was asked by the guard on duty to present an ID and was later handed over a laminated cardboard containing their rules and regulations to read. Among other things, it tells not to cross the lawns, that they allow visitors to take pictures but it should be strictly for personal purposes only, and that model photo shoot is not allowed. Really! I hope this was a recent change in their policy and that my friends did not disobey any of their rules and regulations. As I was leaving the gate, the guard told me to watch out for no entry signs. The place was indeed large and immaculately clean. 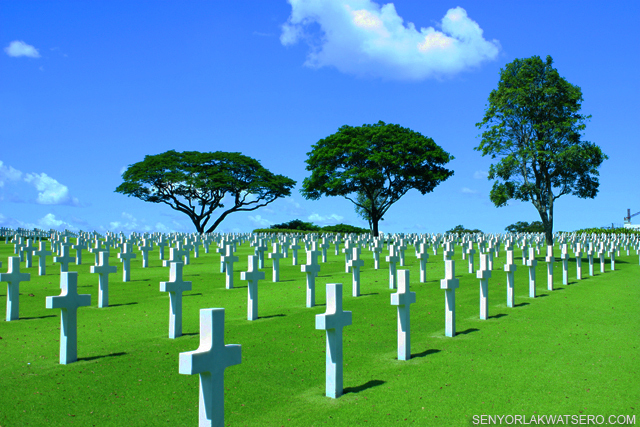 The lawns were well-manicured and on them were rows upon rows of white marble crosses making a striking and beautiful contrast against the green grass and shruberry. I was surprised by the tranquility of the place. 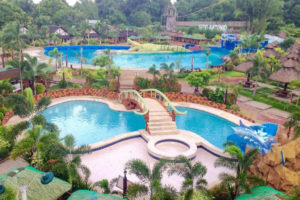 It was so peaceful and quiet inside which makes it an ideal peaceful retreat from Metro Manila’s rat race. 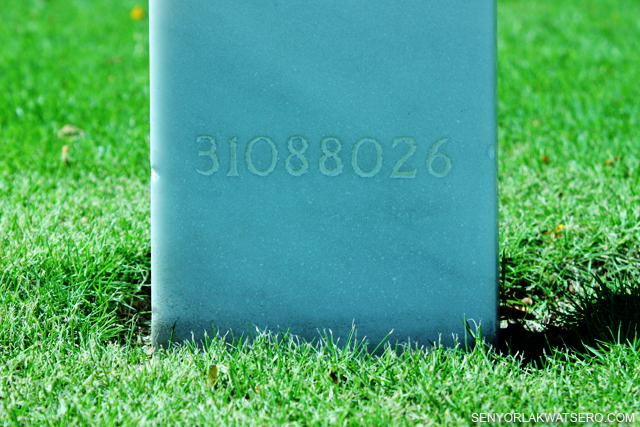 Thousands of headstones are aligned in 11 curved lettered plots forming a generally circular pattern. At some point, I thought the whole place was like a lovely garden of white crosses. Or is it more apt to call it the garden of Death? I surely enjoyed the beautiful scenery, but at the same time, as I looked at the massive number of white cross surrounding me, I couldn’t help but felt deep sorrow for those who lay on those graves, unfortunate young men and women in their twenties whose promising lives were taken away by the monstrousness of war. Many of those who were laid to rest in the cemetery are still unknown. They’re still in the missing list until today. And to lay on a grave in a strange land away from your family and friends without anyone knowing who you are, and with only a number to identify you? What could be lonelier than that? At the far end of the cemetery is the circular memorial building. There are two large hemicycles on each side where huge mosaics depicting battle scenes during WWII can be found. At the center of the memorial is a small chapel where a Carillon rings every hour and a half. 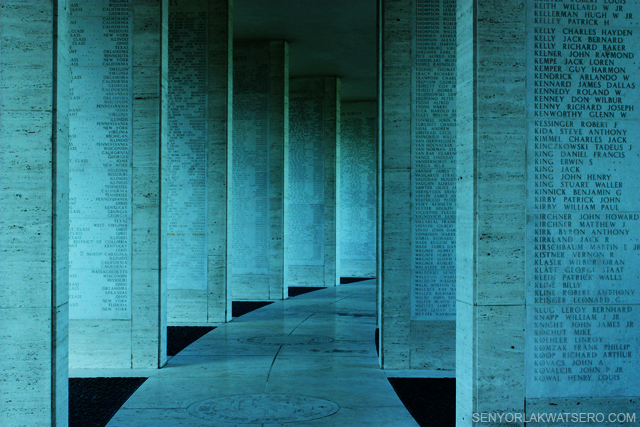 The names of 36,282 of the Missing were inscribed in the limestone columns of the hemicycles. I was glad that a few of those in the list have already been found which is indicated by a golden metal flower mark before their names. 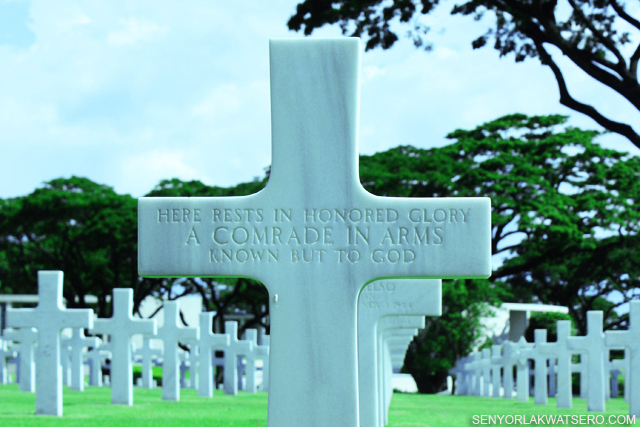 Included in the list are the names of Philippine scouts who helped their American comrades during the battle. On the floors, the Seal of the United States and its 48 states, including the Seal of one of the States of the Union, the District of Columbia and Puerto Rico were carved in alphabetical order. 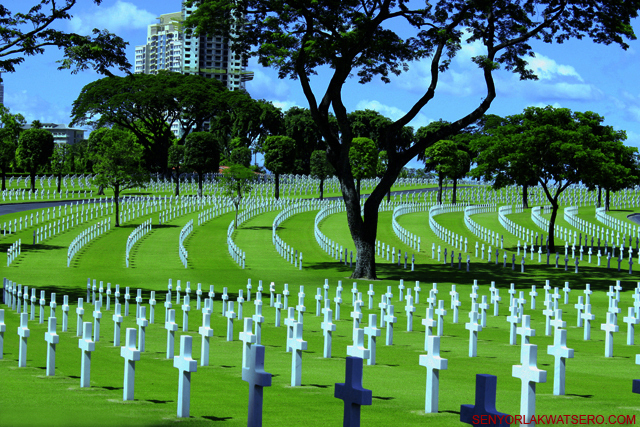 The beauty and serenity of the American War Cemetery and Memorial may bring out different emotions from its visitors. 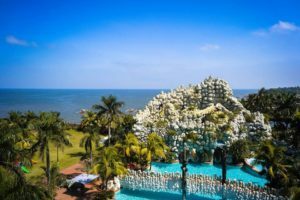 One may initially feel awe at the grandeur of the place, but as one walks around and looks at the many white marble crosses that surround that area, that feeling may turn into a sense of wonder, sadness, maybe anger, and deep sorrow. But at the same time, it may evoke a sense of inspiration, a feeling of great respect and appreciation to all those brave men and women who lay on those graves, the real American heroes, who gave their lives in the service of their country, and galantly fought for our freedom and independence. 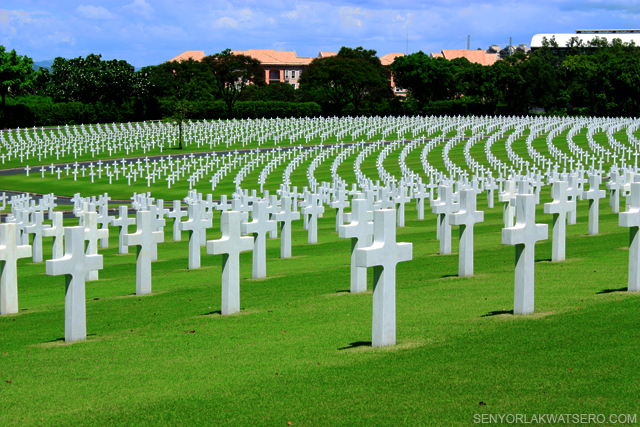 I hope and I pray that someday, those unidentified white marble crosses would eventually be named and that those who lay on those graves may soon find their way home. i said wow to the pictures but on 2nd thought, is there really a “wow” in death? great read. will someday visit the place. hope to catch sunset at this end. thanks, boris. wow would always be the first reaction as the place is indeed lovely. but more than it’s beauty, one should be reminded and be inspired by the unfortunate yet heroic deeds of those who lay on those graves…. thanks tripper! 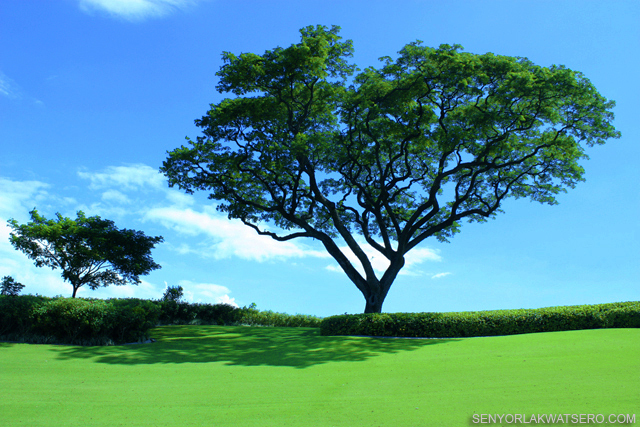 once you enter the place, you’d forget that you’re in manila. you’d get the feeling that you’re in a destination somewehre else far from the city. ” Known unto God”, chilling words ,but these men and women are surrounded by their comrades in arms , laid to rest in a country they fought to liberate. ” Lest we forget”.A well written and well illustrated piece of reportage Senyor. thank you. thanks, ca! andyan lang naman yan. 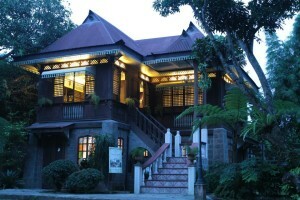 you may visit it anytime you want. Grabe 36,282 missing heroes of World War II at wala pa dyan yung mga identified ones, mukhang mas madami pang casualties sa Iraq war. yup and sobrang nakakalungkot talaga. sana, matigil na yang war na yan in all corners of the earth. It’s beautifully sad, or sadly beautiful. Either of these plus other feelings can truly be evoked when you’re there but you were able to bring out these emotions with the way this entry was written. Great photos and well-written entry, it feels like I was actually there. Thanks Ed. That’s how I really felt when I was there, a mixture of different emotions.